DALLAS--(BUSINESS WIRE)-- TIER REIT, Inc. (NYSE: TIER), a Dallas-based real estate investment trust that specializes in owning and operating best-in-class office properties in select U.S. markets, today announced financial and operating results for the quarter ended June 30, 2018. For the second quarter of 2018, net loss attributable to common stockholders was $8.3 million, or $0.17 per diluted common share, as compared to net income of $4.0 million, or $0.08 per diluted common share, for the second quarter of 2017. For the second quarter of 2018, Nareit-defined FFO attributable to common stockholders was $18.8 million, or $0.39 per diluted common share, as compared to $18.7 million, or $0.39 per diluted common share, for the second quarter of 2017. For the second quarter of 2018, FFO attributable to common stockholders, excluding certain items, was $19.5 million, or $0.40 per diluted common share, as compared to $19.8 million, or $0.41 per diluted common share, for the second quarter of 2017. Our occupancy at June 30, 2018, was 89.4%, reflecting no change from March 31, 2018. During the second quarter of 2018, we leased 94,000 square feet, which included 48,000 square feet of renewals, 23,000 square feet of expansions, and 23,000 square feet of new leasing. During the second quarter of 2018, we provided rent abatements of $0.8 million to tenants at One & Two Eldridge Place and Three Eldridge Place, partially offset by $0.4 million in business interruption insurance proceeds recorded in the second quarter, related to Hurricane Harvey. We anticipate we will receive remaining business interruption insurance proceeds in subsequent quarters. Development of Domain 12 commenced in May 2018. Domain 12 will contain 320,000 rentable square feet and is located in Austin, Texas, adjacent to our Domain 11 development property. We announced today that we are in leases for the entirety of the building. 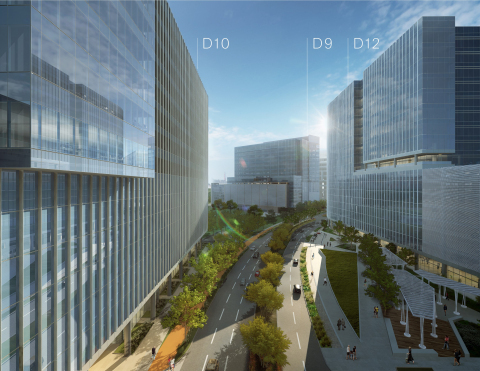 Additionally, we announced today that we expect to commence development of Domain 10, a 300,000 square foot office building in Austin, Texas, in the fourth quarter. Since April 1, 2018, we have sold 2,841,551 shares of common stock for total gross proceeds under the ATM Program of $66.96 million, or $65.73 million net of commissions and issuance costs. Of that amount, 901,300 shares were issued during the last week of the second quarter, while the remainder was issued subsequent to the second quarter. Proceeds from the ATM Program are being utilized as additional funding for our Austin development activities and repayment of the revolving balance of our credit facility. On May 4, 2018, our board of directors authorized a distribution of $0.18 per share of common stock for the second quarter of 2018, which was paid on June 29, 2018. On August 3, 2018, our board of directors authorized a distribution of $0.18 per share of common stock for the third quarter of 2018, which will be paid on September 28, 2018. A copy of our supplemental information regarding our financial results and operations for the quarter ended June 30, 2018, is available on our Investor Relations website at www.tierreit.com/ir, or by contacting our Investor Relations department by email at ir@tierreit.com. A conference call will be held on Wednesday, August 8, 2018, at 11:00 a.m. Eastern time/10:00 a.m. Central time to discuss matters pertaining to this release. Callers in the U.S. or Canada may join the conference call by dialing 877.407.0789. During the three months ended June 30, 2018, we provided rent abatements of approximately $0.8 million to tenants as a result of Hurricane Harvey. These abatements were a reduction to “rental revenue” on our condensed consolidated statements of operations and comprehensive income (loss) for the three months ended June 30, 2018. These rent abatements were offset by approximately $0.4 million of business interruption insurance proceeds for the three months ended June 30, 2018. We anticipate we will receive remaining business interruption insurance proceeds in subsequent quarters. Excludes certain operating properties that were not owned or not fully operational during the entirety of the comparable periods. Our Domain 2 and Domain 7 properties (two properties in which we acquired full ownership in January 2017) are included above as consolidated and at 100% in both periods. During the three months ended June 30, 2018, we provided rent abatements of approximately $0.8 million to tenants as a result of Hurricane Harvey. These rent abatements were offset by approximately $0.4 million of business interruption insurance proceeds for the three months ended June 30, 2018. We anticipate we will receive remaining business interruption insurance proceeds in subsequent quarters.